Gulf South Rising is collaborating with local and regional organizers to coordinate and support over 13 events from August 23-30 in multiple locations from Gulfport to New Orleans. 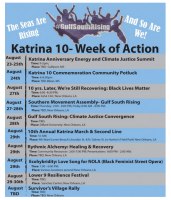 The Katrina 10 Week of Action represents a powerful coming together of many organizations dedicated to lifting up the leadership and resistance of the people on the frontlines. U.S. oil workers in 2015 have staged the biggest strike in 35 years, fighting for adequate wages and safe working conditions. Outside groups help revitalize a six-year workers’ strike against copper giant Grupo México. In Peru, Miners are joining with indigenous, environmentalists and community activists for a national strike on July 9th against Southern Copper Corporation’s plans to develop the Tia Maria copper mine, a mega-project pit mine planned for the Arequipa region of Southern Peru. Attacks by Peruvian armed forces, in league with Southern, have already resulted in the deaths of 3 protesters, with hundreds wounded and detained. In the state of Sonora, Mexico, Southern Copper is using scab labor to bust a labor strike at the Cananea copper mine. Meanwhile, ignoring warnings by the workers that the seals on company wells were defective, Southern allowed the bad seals to leak 10.5 million gallons of sulfuric acid into the headwaters of the Rio Sonora—the worst environmental disaster in Mexico’s history. If you are a friends of the Earth and working families, please call Southern’s US office in Phoenix with phone calls in support of the popular movement demands in Peru and Mexico. We hope to flood the office with calls! Check out the GCC’s Timeka Drew as she speaks with Move to Amend’s Laura Bonham and Egberto Willies on an episode of Move to Amend Reports. As a part of the Philly USSF Food & Climate Justice Working Group, the GCC & PPEHRC are organizing a convergence call series this summer focused on linking the climate democracy crisis to the wave of police brutality against black lives & communities of color in the U.S.
***UPDATE JULY 1, 2015 —-> This call series has ended – please check the GCC website for the archives to be posted soon. Thank you to everyone who participated in these discussions. If you have resources to share concerning community organizing around any of the topics we discussed, please email [email protected] or send a message through our contact form. A delegation of female indigenous activists are making their way to the Shell Annual General Meeting in the Hague to call for an end to Arctic offshore development. Mae Hank and Faith Gemmill-Fredson were part of a mass “flotilla” action in Seattle on Saturday which saw hundreds of people take action next to Shell’s Polar Pioneer drilling rig, docked at the Port of Seattle’s Terminal 5. The Global Climate Convergence is sponsoring a workshop at the Left Forum exploring the upcoming Climate Strike. It will take place during Session 3 from 3:15 – 5:00 p.m. on Saturday, May 31 at 540 West 59 Street. The workshop A People’s Climate Strike: Transformative Justice through Collaborative Strike Action will focus on addressing and combating the economic, political and cultural inequalities that are the root causes of the climate crisis through the revolutionary action of a collaborative strike. Topics will include building a foundation for strike action through the U.S. Social Forum Climate Strike People’s Movement Assembly, diversifying outreach, and redefining the current understanding of collaborative strike action to create a broader base of participation and support. We will be exploring possible outcomes of the first wave of strike action leading up to the opening of the COP21 Climate Change Conference in Paris on November 30, as well as organizing into 2016 and beyond. Register online for the Left Forum before May 27 for a discount. Low income as well as youth and student registration is available. …One way to guarantee an end to the climate crisis is to stop doing the things that are heating the planet. Stop fossil fuel production and use. Stop greenhouse gas emissions. Stop rainforest devastation. And since the corporate and political capitals of the world are unwilling to stop themselves, we must stop them ourselves. We can stop them by refusing our participation and cooperation. We can stop them by withholding our labor. By folding our arms we can halt the machine responsible for the climate crisis and in one fell swoop create the space for the new, green economy to take root. We should go on strike….